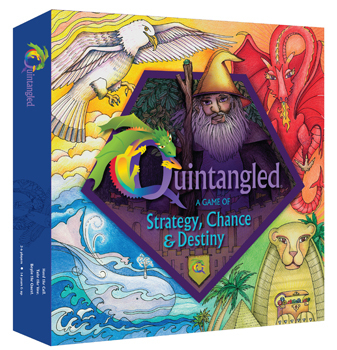 Enter the Magical Realm of Quintangled, a unique and inspiring board game of Strategy, Chance, and the mysterious element of Destiny! Channel your inner hero and quench your thirst for adventure as you explore the enchanted World of Quintangled. Every game experience will be different as you navigate the many opportunities and encounter twists of Fate that will craft a different outcome each time you play. Begin by rolling the eight-sided die to determine the Character you will assume: Knight, Lover, Jester, Healer, Dreamer, Sage, Monarch, or Priestess. Number OF Players: 3 to 6 players to allow the game to proceed at a steady pace. An 8-sided die and tokens. Character cards. 2-sided Q card which provides all the instructions to easily and quickly learn to play the game.